I love decorating our house for all of the holidays each year, and today I’m sharing our Valentine’s Day décor! This year I kept it pretty low-key. Typically our mantle gets a pretty big makeover, but now that I have my bar cart, all of the focus has shifted toward it and that’s just the way that I like it! I didn’t want to leave the mantle out completely, so I strung this adorable tulle garland across it and that was it. It’s amazing what a punch that one little item packs! The pink flowers are part of my every day décor, and we all just so happen to be wearing red in our family pictures on the mantle, so I love how that every day décor ties right in with the Valentine’s Day theme. Now for the bar cart… oh how I love decorating this thing! I am having way too much fun! And pink is my favorite color so I had a particularly good time with this holiday. I also still have my lights on there and I’m pretty sure I’m just going to leave them up year round. I love that extra little bit of twinkle that it adds to the room. As for the decorations, most of them are from the Target dollar spot, one is from TJ Maxx, and a couple of things are actually left over from Olivia’s first birthday party! :o) The Rae Dunn champagne flutes were a TJ Maxx find as well, but a similar set is here on Amazon. And FYI, if you've been thinking about getting a letter board but didn't want to spend the money, Amazon is having a HUGE sale on the one that I have... buy it here. The last thing I decorated was my tiered tray… I’m having almost as much fun decorating that for the holidays as I am the bar cart! And wait, I can't forget the coffee bar! 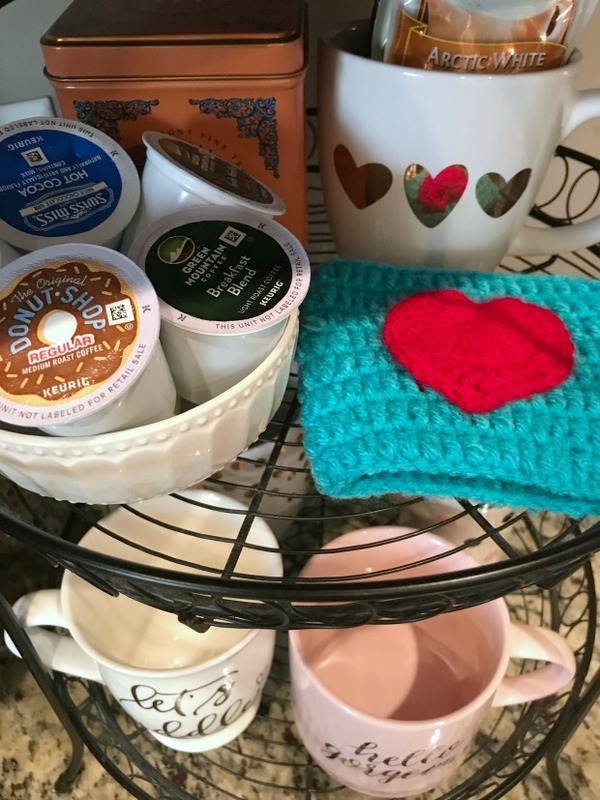 I have to showcase all of my cutesie Valentine's Day mugs! You need to be an event planner!! You are so good at this kind of thing! So cute! I love your tiered tray!!! Thanks, girl! I love it, too! I really like the simple touch to your mantle - it's so cute and like you said, packs a punch! Goes perfectly with your flowers! And your bar cart is always a favorite - I think keeping the lights up is definitely the way to go. Adds even more twinkle lights to your home! So much love! I adore the Pom garland! The little pink heart pitcher is precious and your Bar Cart touches of pink are perfect! Your kiddos will grow up to appreciate how mama always decorated. I love all of your decorations. That bar cart is so cute and festive and I love the chalk board as well. I love the tiered stand too! My Valentine’s décor is lackluster at best. I need to change that! Your mantle looks great and the garland is the perfect touch! That picture above your mantle gives me all of the heart eyes. Your bar cart is adorable as always. What a fun little area to decorate. Isn’t the Target dollar spot the best? We keep our TV on our mantle so I've never decorated it, but I feel like a garland would be awesome for it! The bar cart is really cute as always! Love the lights on it! Love it!!! I think my favorite part is your bar cart! It looks gorgeous! Thank you! The bar cart is my favorite, too! Super cute! If I ever get my house put back together 100% I will be so excited...I just feel like it's a waste right now to decorate when things are still kind of crazy. Your bar cart looks FABULOUS! Such cute decor!! Your bar cart looks, AMAZING!! I have serious bar cart envy!!! 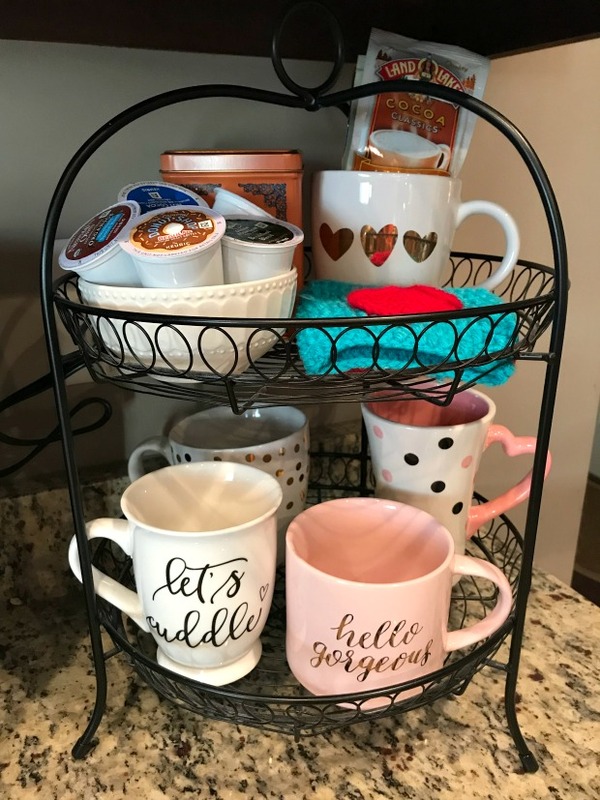 I love the garland on your fireplace, and the cart and tray are both so cute!!! I haven't decorated at all for Valentine's Day this year, but I plan to decorate for every holiday next year when my daughter is a little older and might notice more.